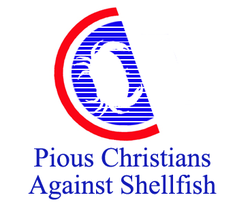 Logo of the Pious Christians Against Shellfish. Pious Christians Against Shellfish (often abbreviated PCASF) was a radical American religious group active from 1981 until 2003. The group’s primary cause was—in the words of founder Rev. 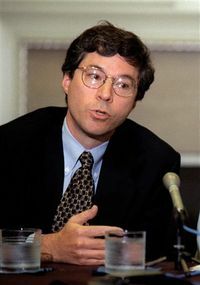 Michael Fordworth—the “holy crusade against shellfish, people who eat shellfish, and shellfish eaters,” all of whom, according to the group, were “destroying America and eroding family values” by either consuming or pushing for the consumption of shellfish like Lobster, Crab, and Shrimp—something that is expressly forbidden in the Bible. 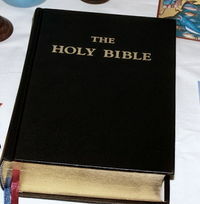 The Book of Leviticus is often cited as justification of the anti-shellfish positions of the PCASF organization. As shellfish—or, more precisely, any marine animal without scales—are said to be an abomination and unfit for human consumption, anyone who partakes in shellfish flesh is a sinner, according to the tenets of the group. Pious Christians Against Shellfish was founded by Rev. Michael Fordworth in 1981. When put into historical context, the organization’s founding can be considered part of the rise of the “New Right” in the early 1980s, although PSASF was certainly among the most radical of the Conservative organizations and think tanks that emerged during that period. The group’s initial membership was small, and stayed such for the first two-to-three years of its existence. However, in the mid 1980s—around the same time casual dining restaurant chain Red Lobster became popular—the group began to grow rapidly. Pious Christians Against Shellfish had 5000 active members spread throughout the United States by 1985, and twice that number by 1987. Although the group’s numbers peaked in 1988 before steadily declining thereafter throughout the 1990s, it was during the 1990s that the group gained its now-infamous reputation. In the early 1990s—perhaps in response to the Leftist swing America experienced during the 1992 Presidential Election—PCASF turned away from its restrained heritage and became a fringe group, organizing some of the most violent and notorious anti-Shellfish acts in US history. Three Long John Silver's restaurants just like this one were bombed in the Louisville, Kentucky area in August of 1992. Although not officially organized by PCASF, the all seven people tried and convicted for the bombings of three Long John Silver’s restaurants in the Louisville, Kentucky area had ties to the organization. To this day, the 1992 Long John Silver’s Bombings remain one of the most tragic events in the history of the Long John Silver’s chain. In the early morning of August 22, 1992, Louisville police responded to an explosion that destroyed the entire back wall of a neighborhood Long John Silver’s restaurant. Though no one was killed—the establishment had not yet opened—the Louisville police were put on alert. Three days later, another bomb went off on the evening of August 25—the target being another Long John Silver’s. The blast claimed two lives; both dead were fortunately only Long John Silver’s employees. The Louisville police once again investigated, and were able to obtain outdoor surveillance tapes from a Planned Parenthood across the street. The Planned Parenthood’s surveillance cameras caught both the group of bombers and their mode of transportation—a large, nondescript white van—information that would eventually lead to the capture of the “Battered-Fish Bombers,” as they would come to be known, though not before the tragic events of August 27, 1992. August 27, 1992 would see yet another attack on the Long John Silver’s chain. This bombing, however, took place in the midst of the restaurant’s early-afternoon lunch rush; 14 people—six employees, seven customers, and one person who came in simply to use the restroom—died. 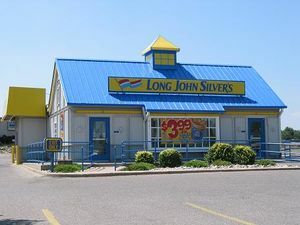 The Long John Silver’s Bombings permanently turned public opinion against the PCASF, and would continue to haunt the organization for the remainder of its existence. Despite the efforts of organizations like the Shellfish Eaters' Defense League, the consumption of shellfish was made illegal in California after the 1998 elections. PCASF founder Michael Fordworth, circa 2000. Despite their victory in California and the election of a Republican President in 2000, membership in Pious Christians Against Shellfish declined even more in the early 21st century. Many were drawn away from the group by the emergence of other issues during the period, like the Terry Schiavo case and the question of gay marriage. Others, on the other hand, grew disillusioned with the group’s increasingly radical stances. In late 2002, the Michael Fordworth controversy would prove to be the nail in the coffin for the group. On October 16th, 2002, Michael Fordworth was found dining with a gay prostitute in a Red Lobster in Seattle, Washington. The organization’s waning membership was outraged; Rev. Fordworth’s assurances that the entire event was a fabrication of the liberal media did little to halt the exodus. By the middle of 2003, PCASF was all but defunct. Rev. Fordworth would retire from the anti-shellfish circuit, and eventually retired from public life altogether. He died in 2006. This page was last edited on 7 December 2014, at 09:55.